The Campaign for Real Education was formed in 1987 to press for higher standards and more parental choice in state education. It is not affiliated to any political party and is funded entirely by voluntary donations. Formed in 1987 by 14 parents and teachers, all of whom were concerned about falling standards and damaging changes in state education which were being forced through without any evidence to support them. Since then, the Campaign has been contacted by thousands of parents, teachers and academics with similar concerns. We now have a nationwide network of supporters and important links with like-minded people in other countries. 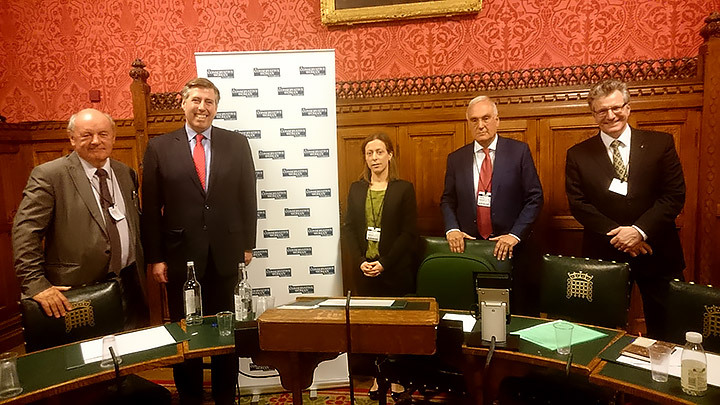 At the Cambridge Union 29 November 2018.
by Graham Brady MP, chairman of the Conservative Party’s 1922 Committee. They were opposed by recently retired Ofsted chief, Sir Michael Wilshaw and by Dr. Andrew Cadman. The motion in favour of expanding grammar school provision was carried by a large majority. The CRE is, and always has been, a voluntary organisation, totally independent in nature and free from any political affiliations. The work of the CRE is as important today as it was when it was founded in 1987. Set up by Nick Seaton and his colleagues, they worked indefatigably to highlight and campaign against worrying trends in British education. Sadly, Nick passed away in 2012. We wish to continue to honour Nick's hard work. We do, of course, incur certain costs such as the maintenance of this website. We are entirely dependent upon donations from our supporters. Any contribution you may wish to make, no matter how big or small, will be very gratefully received. Your contributions enable us to fight to bring common sense back into education. from here, to make a contribution. Please subscribe to our mailing list to receive our electronic newsletters.